Home > Undertake adaptation > Taking action > What is the least I can do? Many organisations attempting to adapt to climate change have limited financial and human resources and capacity. Adapting to climate change is just one more pressure that must be dealt with among many others, creating competition for resources within organisations. We present here a series of actions that are the least that can be done in terms of adaptation planning, and that require very minimal resources. A good starting point is to use existing information and data (climate change projections, maps, state/local government reports) to understand the broader climate change risk of your area and the potential implications for your business. The principal goal of this low-resources approach is to evaluate the urgency of the situation. Do the risks from climate change present an imminent threat that must be dealt with now, or is it possible to safely delay action into the future? If taking this approach, it is not sufficient to simply gather evidence to support the decision that action can be delayed. It is necessary at a minimum to decide when to revisit the situation to re-evaluate the risks. Climate change is one of many issues that must be considered and managed by organizations (i.e. businesses, local government, industries etc.). It therefore presents an additional burden on already limited resources. Many organisations consider that they lack the internal financial and/or technical capacity to address climate change risks. Lack of resources does not mean adaptation planning and implementation cannot be done, and there are certain actions that can and should be taken. Here we describe the minimum efforts that an organisation can make in climate change adaptation and also point towards available knowledge, datasets and guidance. We also look at CoastAdapt’s adaptation decision support framework C-CADS and highlight some high-level steps that can be taken within that framework. Following the suggestions outlined here would allow a preliminary adaptation plan to be prepared with limited resource and time. Understanding the broader climate change risk of your area is a good starting point. This can be done by performing a quick desktop-based screening of climate change related hazards and their associated risks. The hazards specific to coastal areas are likely to include inundation and erosion linked to sea-level rise, and the extent to which they constitute a risk depends on factors such as the erodibility of your shoreline, and the extent to which homes and infrastructure are concentrated close to the shore. access information on sea-level rise, on the risk it poses to your area because of the erodibility of the coastline and what areas are at risk of inundation at two future times – 2050 and 2100. Combining this information with any existing local information and data you may have, a high-level risk screening can be performed. CoastAdapt provides guidance to perform a first-pass risk assessment, which requires minimal resources and an easy to use spreadsheet tool (Risk assessment templates). There are other risks associated with climate change that are not specific to the coastal zone, for example risks associated with more intense and more frequent heatwaves and bushfires. NCCARF has information on these broader risks in its Synthesis Products. Financial loss: Although studies are limited, there are many adaptation options that will provide benefits in excess of costs, especially when non-market values of human and ecosystem well-being are included in the calculation. Damage to the natural environment: Failure to take action to strengthen the capacity of ecosystems to withstand climate change will lead to species extinction and fundamental changes in our natural environment. Risk of litigation: Failure to take action to adapt to climate change and sea-level rise, even though the risks are known, leaves coastal managers open to legal challenge (see Reducing legal risk). Inability to insure: There are already examples of insurers refusing to provide insurance cover for flood risk in communities lacking flood defences. Loss of opportunity Climate change is expected to bring some opportunities, for example, in agriculture, fisheries and tourism, and at least in the early decades. Actions such as marketing campaigns can maximise these opportunities. For more information on understanding implication of not taking any adaptation action see Implications of taking no action. Testing the robustness of your existing management plans (e.g. coastal zone management plan, organizational risk management plan etc.) under climate change can identify whether any amendments or updates are required to address future risks. Often existing management plans are well established within the organization and play critical roles in business continuity. Therefore if there is a possibility that they will be less effective under future climate change and sea-level rise, it is important to know this and to move to ensure that climate change is taken into account. This step has the added benefit of drawing the attention of senior management to how climate change can affect core business activities. Finally, it is important to ensure, when writing any adaptation plan, that this aligns well with the goals and activities in any existing management plans. In testing the robustness of existing management plans under climate change, the following are key questions to ask. Is a given plan, action or management strategy affected by any climate stressors that may change in future (medium and long term)? What are those stressors, and how might the effects be reduced? How effective will the existing plans, actions or management strategies be under projected changes in climate and sea level? Do existing plans, actions or management strategies have the potential to exacerbate climate change impacts or conflict with other possible future adaptation actions? Are the plans, actions or management strategies still relevant in a climate affected future? Can the plans, actions or management strategies be extended, or built on to take into account climate change risks, and hence contribute to or incorporate adaptation planning? If yes, is a separate adaptation plan required, or is it sufficient to modify existing plans? Who do you need to engage with to make this happen? The degree to which you need to take action depends on your exposure to current and future climate risks, and on the amount of risk your organisation, stakeholders and community are willing to accept. There are uncertainties associated with climate change, and this may be a rationale for delaying action until it becomes absolutely essential. This approach is known as ‘adaptation pathways’. It requires a careful analysis of climate change hazards, and in particular an evaluation of how these are likely to change, and the point, or threshold, at which the risks will become unacceptable and action can no longer be delayed. CoastAdapt contains information on the Pathways approach. If you decide to take the pathways approach— and that the risks from climate change do not currently require you to take action— you should carefully document this decision, including the underlying rationale. Ideally, you should lay out the future adaptation pathway, including determining the threshold events (e.g. triggers such as unacceptable levels of flooding or new information) which will stimulate action, and how thresholds will be determined and measured. At a minimum, you should set a definite deadline to revisit the situation to re-evaluate the risks. As explained above, it is possible to create a high-level and preliminary adaptation plan with limited resources and time. 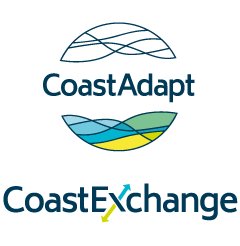 CoastAdapt provides a decision support system (see Coastal Climate Adaptation Decision Support or C-CADS). This decision support process takes users through a series of steps, linking to more detailed guidance, tools, data and information, to develop, implement and monitor an adaptation plan. It provides guidance on building a business case, financial options, prioritising action and seeking community support and buy-in. C-CADS can be used in its entirety to create, implement and test an in-depth and very comprehensive plan. Equally, the first steps can be used to create a high-level plan that may demonstrate, at least for the moment, that no risks are sufficiently high to require immediate action. Conversely, it can also demonstrate that resources need to be found to investigate further because there appear to be immediate risks. The purpose of the first-pass scan is to evaluate how urgent the need is for action. For more information on minimum resource need for adaptation planning see Decision-support checklist on assessment of resource needs. For council specific information see Climate change adaptation and your council: where to start?